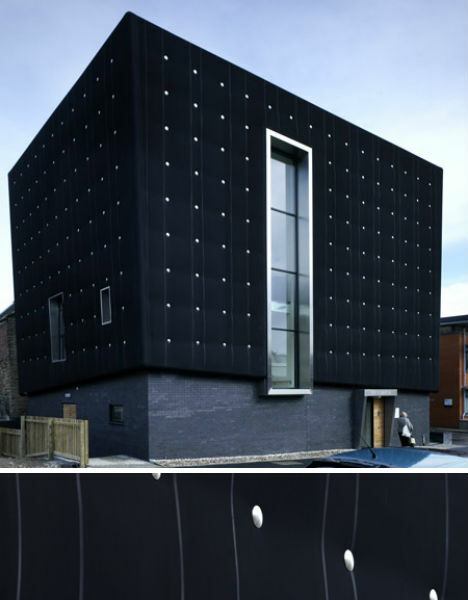 Solid black isn’t a typical choice for most architecture. It’s stark and imposing, seeming to send a message that booms ‘go away.’ But sometimes, it works. 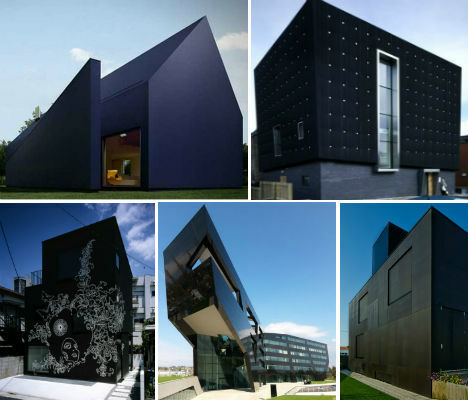 These 15 all-black monochromatic buildings use techniques like unusual textures, cut-outs, cantilevering and pops of bright colors to soften the effect – and some just revel in their darkness. 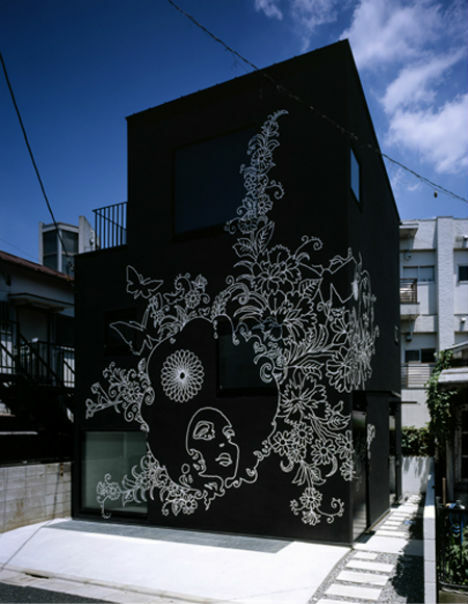 Even in a city with hundreds of unique and eye-catching houses, this one stands out: ‘Sin Den’ by Klein Dytham Architecture, a black residence/salon covered in white illustrations. 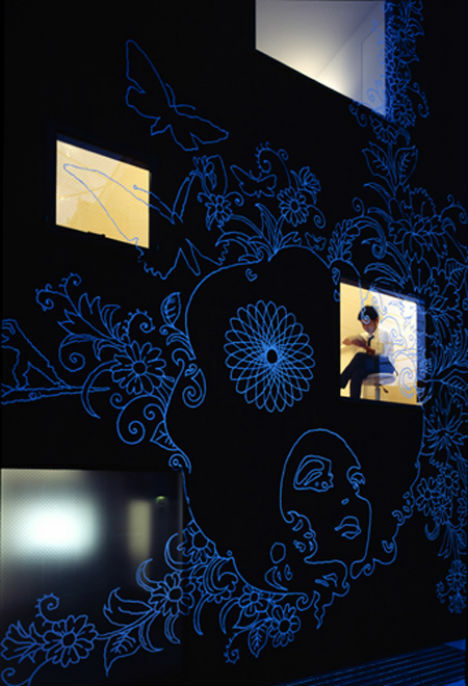 Meant to attract “those who have their own style and seek a perfect hideaway”, the house functions like a giant canvas and has a surprisingly bright and open-feeling interior. 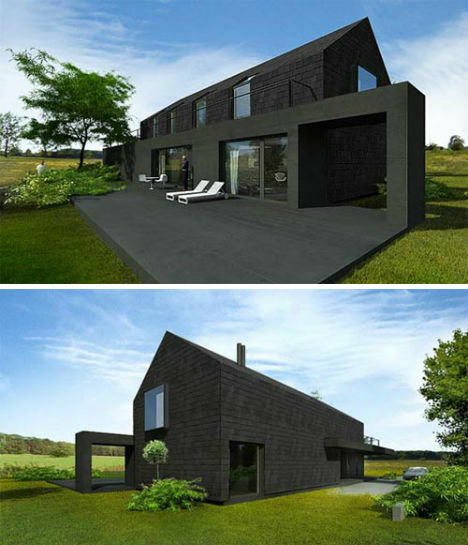 This home maintains the traditional shape of Polish houses, but brings it firmly into the 21st century with an unusual all-matte-black exterior in the form of a plastic insulation material called Thermaplan. Durable and weatherproof, the material is available in any color. Going beyond the usual effort to soundproof the interior of a music studio, Careyjones architects and Jefferson Sheard Architects covered the outside of ‘Soundhouse’ with insulating material, too. 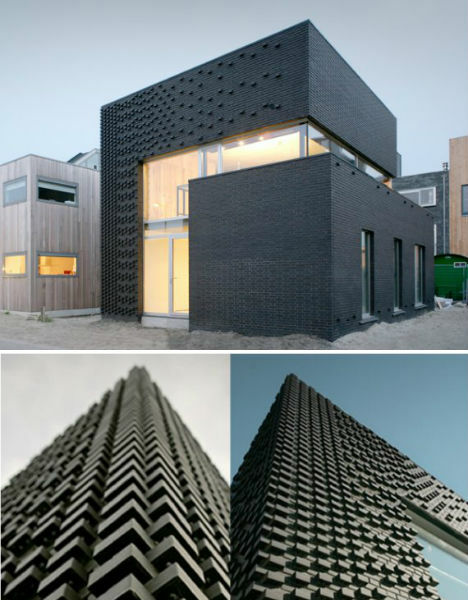 “The overall aesthetic of the black rubber quilt is intended as a literal translation of the need to acoustically contain the building’s use,” says Mike Harris of Careyjones. 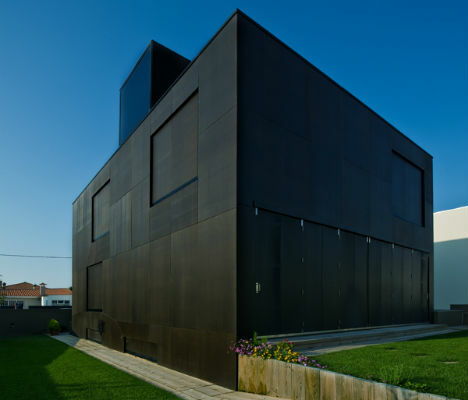 FFAT House in Vila Nova Gaia, Portugal looks kind of like a formidable black fortress, and Arquitectos Anonimos basically intended it that way: it’s closed off from ‘excessively close’ neighbors. The design takes full advantage of the lot, rising above the rooftops of adjacent homes so the roof terrace affords a view of the sea. 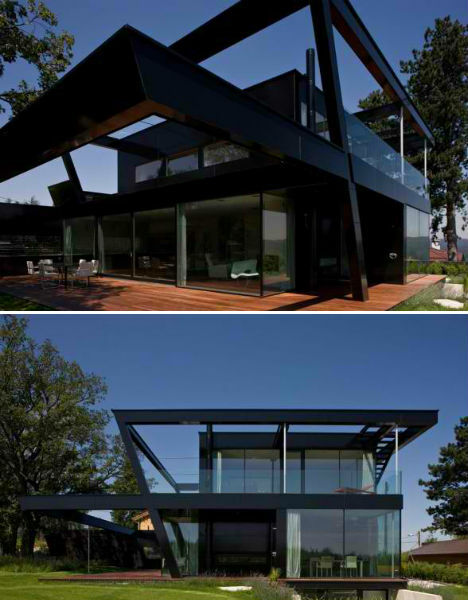 The dark waterproof plywood of the facade serves as a ‘space suit’ that protects the house against the ‘radiation’ of the outside world, with black covers even rising to close off the windows. Two skylights bring daylight into the house even when the exterior ‘skin’ is completely closed. Stacked rectangular volumes covered in windows make up the Axis Viana Hotel by VHM in Viana do Castelo, Portugal. The combination of voids between the cantilevered levels of the building and all of that sky-reflecting glass helps soften its dark, angular appearance. 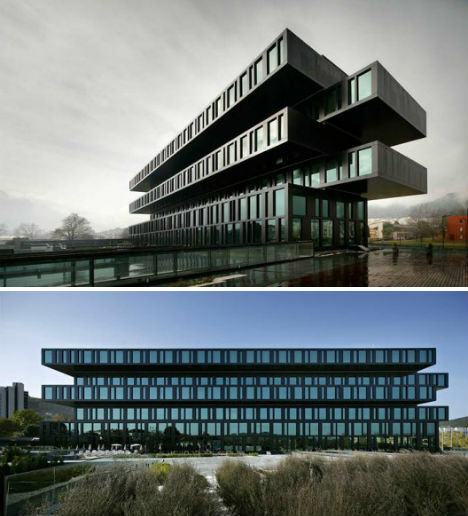 A knife-like cantilever and glossy black exterior give the Uniopt Pachleitner Group headquarters in Graz, Austria an impressive sense of drama. 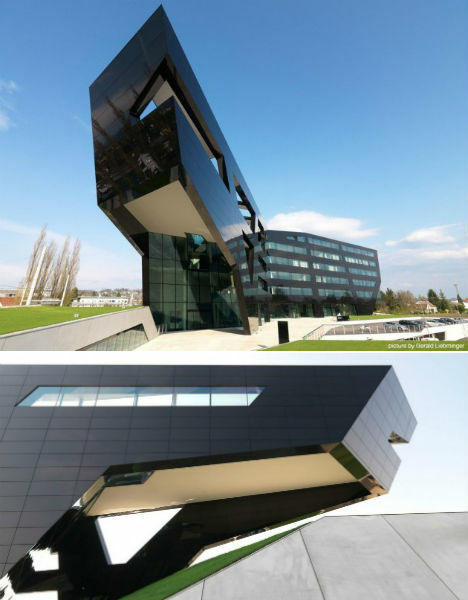 GS Architects gave the MP09 building the nickname ‘Black Panther’, intending a sculpture-like aesthetic with dynamic sharp edges. The harsh exterior contrasts with its tranquil interior filled with organic materials and patterns and lots of daylight. This conceptual proposal is another modern take on traditional Polish architecture, not only making the exterior all black but adding a few geometric volumes that extend the living space and give the building a little more visual interest. Liechtenstein’s state museum of modern and contemporary art in Vaduz was designed by Swiss architects Meinrad Morger, Heinrich Degelo and Christian Kerez. 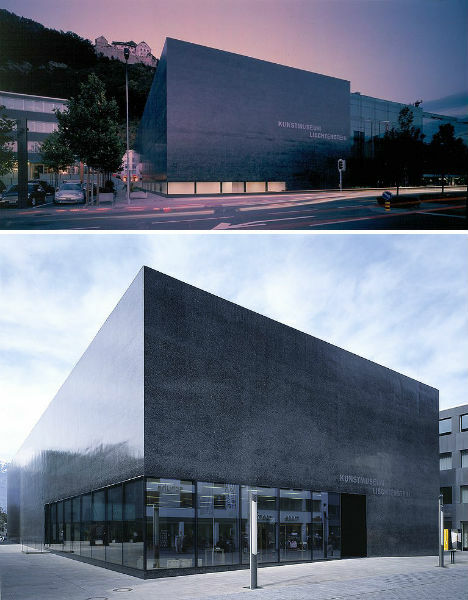 Completed in 2000, the black museum is made of tinted concrete and basalt stone, with river pebbles embedded in the exterior to echo the landscape of the Rhine Valley. With an expansive frame and large panels of glass, architect Kai Stania’s private home in Vienna is simple but certainly not boring. Stania wanted to make a strong design statement in a sustainable home that requires very little maintenance, turning to Trespa Meteon panels for the exterior. These smooth and glossy eco-friendly panels have the appearance of polished black marble, but are cost-effective and will stay looking new for many years. 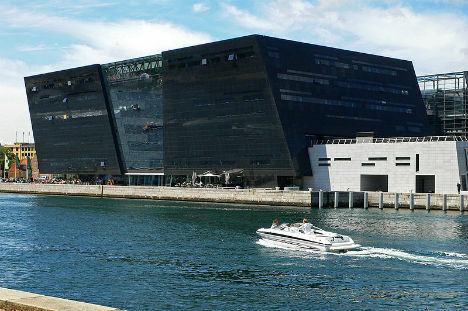 This waterfront expansion to the Royal Danish Library in Copenhagen, Denmark was nicknamed ‘The Black Diamond’ in reference to its glittering polished granite cladding and faceted shape. Designed by architects Schmidt Hammer Lassen, the building is divided in the center by a glazed ‘crevasse’ that lets natural light into the central atrium inside. It’s easy to see why this building is nicknamed ‘Black Maze’. 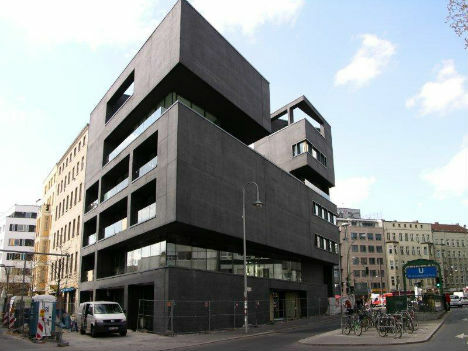 The L-40 building in Berlin is made of matte black concrete and was designed to pack as much space into a tiny lot in the city’s cultural center as possible. Designed by Roger Bundschuh and Cosima von Bonin, the L-40 is a residential and commercial building consisting of stacked volumes punctuated with roof terraces and open galleries. 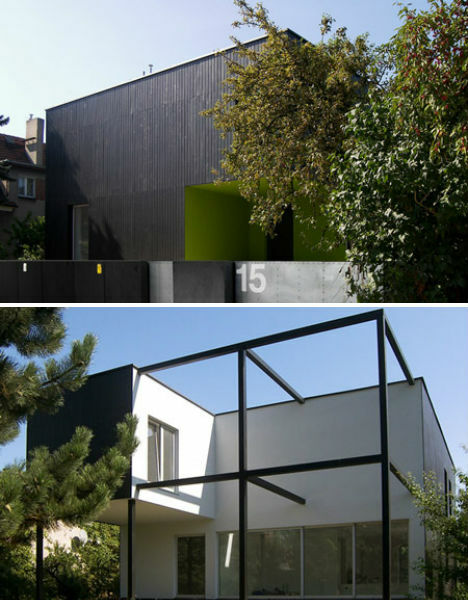 An existing home in Warsaw, Poland was expanded with additional rooms and a black steel frame and covered in black-painted wood panels. 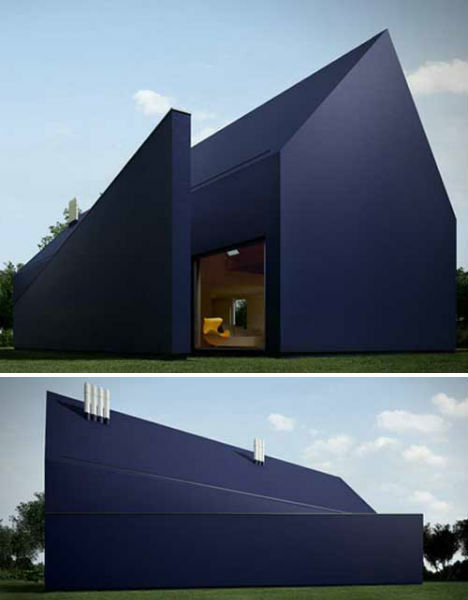 ‘The Black Cube’ by KameleonLab architects looks like a solid black volume from one angle, but colorful voids within the overall shape give it a sense of lightness. 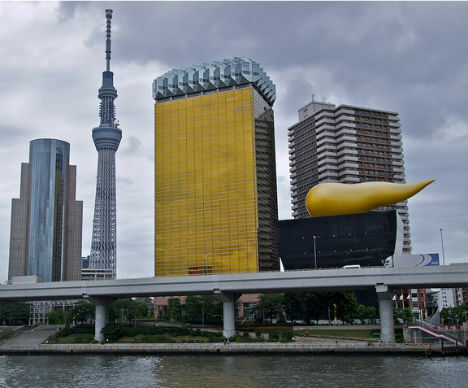 One of Tokyo’s most notorious buildings is the Asahi Flame, located on the banks of the Sumida River. The golden squiggle atop the monolithic black building has been dubbed ‘the golden turd’ by locals who aren’t exactly impressed with the artistry of architect Philippe Starcke. 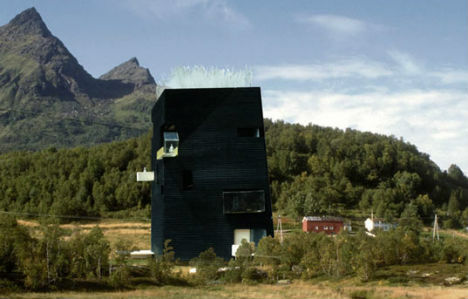 Taking inspiration from the black rocks and white snow of the Swiss Alps, architect Stephen Holl created an unusual home for the Knut Hamsun Museum in Norway. You’re not seeing things – the building is just a little bit off-kilter. Its exterior is covered in tarred black wood, which is commonly seen on the region’s churches. Says Holl, “These strange, surprising, and phenomenal experiences in space, perspective and light provide an inspiring frame for exhibitions… the building is conceived as an archetypal and intensified compression of spirit in space and light, concretizing a Hamsun character in architectonic terms.” Hamsun is known as Norway’s most inventive 20th century writer.